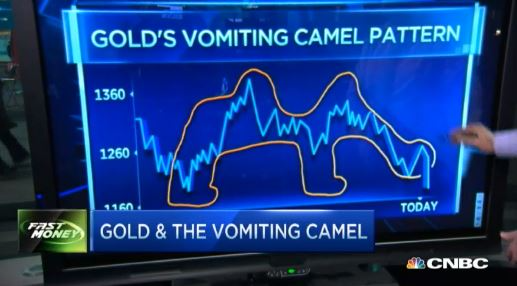 Our previous Stock Exchange asked readers if they were reacting to the ominous Vomiting Camel pattern that is forming in the market. And of course, this was meant as a joke, in order to poke fun at traders over-fitting the data when developing their trading programs. A glance at your news feed will show that the key points remain relevant. An “anomaly” is something that deviates from what is standard, normal, or expected. And in trading and/or investing, a market anomaly (or market inefficiency) is a price and/or rate of return distortion that seems to contradict the efficient-market hypothesis. “Beating the market” is something many traders try to do, but few actually succeed. Throughout history, many market anomalies have been touted. Here are three such anomalies that beat the market. Momentum is the market anomaly whereby rising stock prices tend to rise further, and falling stock prices tend to keep falling. And Eugene Fama is the Nobel Prize winner who came up with the Efficient Market Hypothesis (i.e. the theory that says stock prices fully reflect all available information, thereby making it impossible for anyone to consistently beat the market). Fama is not well-known or liked in popular media, but he is absolute royalty is the world of academia. Specifically, he said momentum is the one example of a market anomaly where the data is actually robust enough to make it difficult to deny momentum is a valid anomaly. We use momentum in our trading models, and we’ll give some specific examples later in this report. 2. Sell in May (or is it Buy? ), and then Go Away! Buy in May Go Away. One of the few advantages small traders and investors have over “the big guys” is the ability to participate in niche markets. For instance, this can include low-volume options markets and thinly trade bond markets. 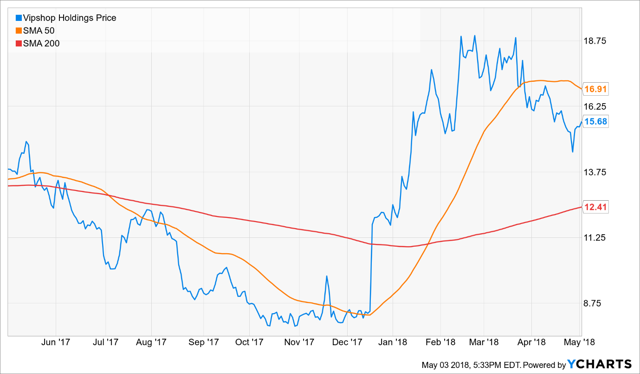 For example, Blue Harbinger’s favorite hedge fund is often able to move in and out of thinly traded bond issuances at attractive prices because of the fund’s relatively small size. This is an attractive niche space that a $10 billion PIMCO fund is simply too big to participate in with any significant degree of success. Further still, even when data “proves” that anomalies exist, exploiting them in real life is often more challenging than meets the eye. Per reader feedback, we’re continuing to share the performance of our trading models. 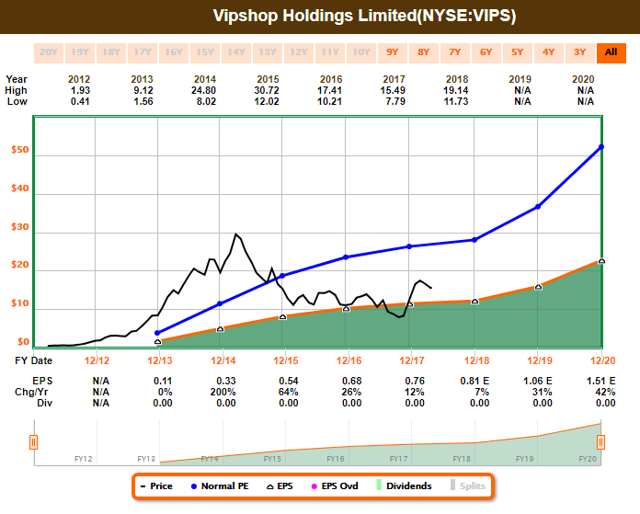 Holmes: I sold Vipshop (VIPS) on May 1st for around $15.30 per share. Are you familiar with this stock, Blue Harbinger? Blue Harbinger: Yes, we discussed VIPS when you purchased these shares for around $8.35 back in October. VIPS is a Chinese company, and it trades as an ADR. It’s basically an online discount retailer for brand names. They have flash sales where they have a limited amount of brand name products to sell. 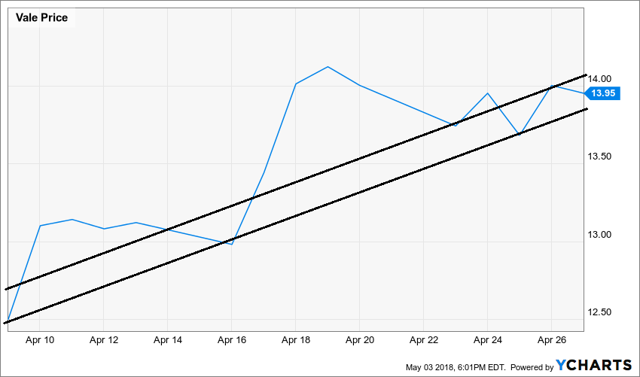 Did you sell because it’s May, and you believe in the mantra “sell in May, and go away” that was covered earlier. Holmes: No, that’s not the reason. As you know, I am a “dip-buyer.” And as you can see in the chart below, the shares have recovered nicely since they dipped back in October. BH: Not a bad trade, Holmes. Looks like you made some money. Was there something in the fundamentals you saw that caused you to sell? Here is the Fast Graph. Holmes: Thanks for asking and sharing, but you know I am a model, and all of my trades are generated systematically and based on the technicals. BH: True. And again, nice trade. How about you Road Runner—any trades this week? Road Runner: Yes. 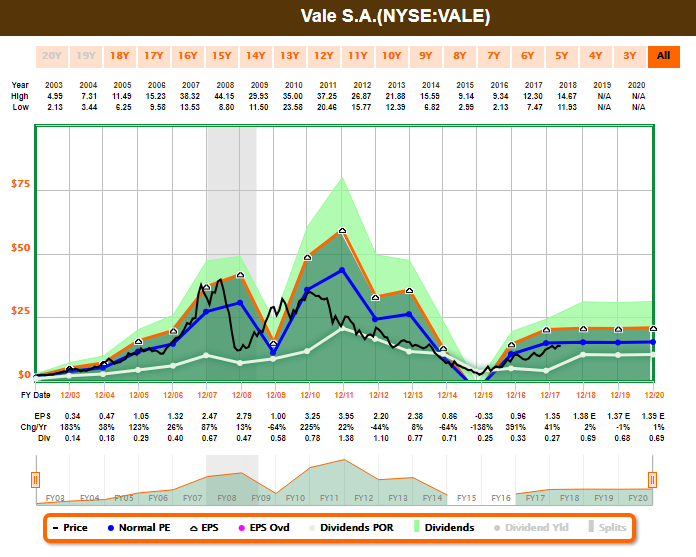 This week I purchased Brazilian company, VALE (VALE). The company engages in the production and exportation of iron ore, pellets, manganese, and iron alloys, which are raw materials needed for steelmaking. BH: Interesting. I know you like to buy stocks in the lower end of a rising channel. And based on the following chart, I can see why you purchased VALE. Road Runner: That’s exactly right. And you also know that my typical holding period is only around 4-weeks, right. BH: Yes, I did know that too. 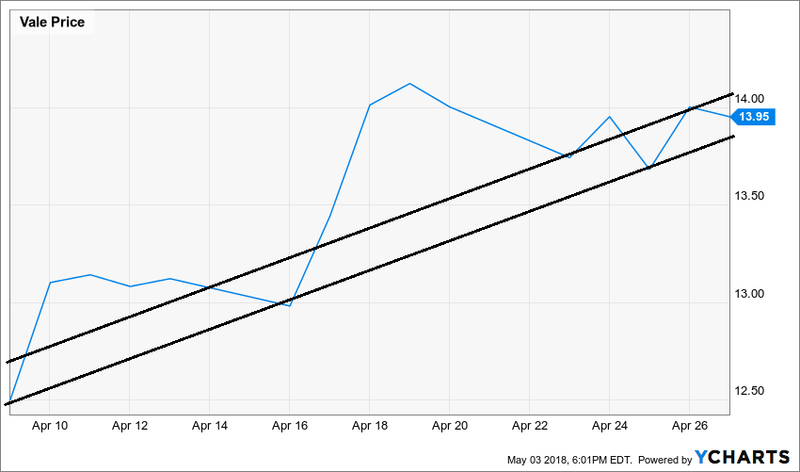 VALE announced earnings near the end of April, and results were slightly below expectations, which caused the dip. Here is a look at the Fast Graph. Road Runner: Thanks for that background, it’s always interesting to hear you make up a story to fit the chart. BH: It’s not a made up story—that’s what happened. Q1 EPS was $0.31, $0.05 below expectations, and revenue was $8.6B (+0.9% Y/Y), $150M below expectations. Anyway, how about you, Athena—any trades? Athena: Yes. Like Holmes, this week I sold my shares of Vipshop (VIPS). However, unlike Holmes, I bought my shares in early January. BH: Looks like you didn’t do as well as Holmes on your trade. Why’d you sell, Athena? Athena: I sold according to my trading program. It was a combination of time (I usually hold about 17-weeks), price, and some additional propriety factors. I didn’t make money on this trade, but I didn’t lose much either. Losing less on your losers than you make on your winners is better than the other way around. BH: True. And thank you. How about you Felix—any trades? Felix: No trades to share this week, but I do have a ranking for you. Specifically, I ran the Nasdaq 100 through my model, and I’ve listed the top 20 below. BH: Interesting ranking. What is the criteria? Felix: I am a momentum trader. However, my typical holding period is around 66 weeks, on average—much longer than the other traders. BH: I like your top 3 picks this week. They’ve certainly had momentum over the last year, and they’ve also got the fundamentals to keep running, in my view. How about you, Oscar—anything to share this week? Oscar: Yes, this week I ranked our “diverse and comprehensive ETF universe.” Here are the top 20. BH: I see Oil (USO) ranked at the top. This makes sense considering you are a momentum/trend-follower trader, and oil prices continue to rally, even though they’re still far below where they were in early 2014. Oscar: Yes. Our version of momentum is more complicated than simply securities that have been rallying, but you have the general idea right. Many market anomalies are discussed by traders, but only some of them are supported by data, and they’re often challenging to implement in real life. However, as shown in our earlier performance table, we’ve been having success with our trades. Further, our various trading programs have the ability to operate in certain niche market spaces, thereby giving us more opportunities to beat the market in terms or risk versus reward, and because our strategies can often add highly valuable diversification benefits because of their lower correlations with the overall market.